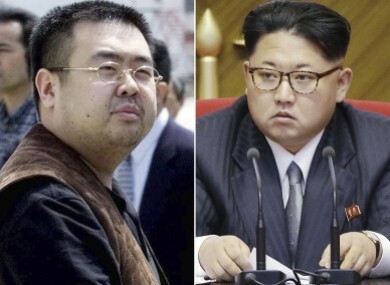 The deceased Kim Jong Nam, left, and his half-brother, North Korean leader Kim Jong Un. MORE THAN A month after Kim Jong-Nam was murdered in Kuala Lumpur, experts are struggling to make sense of Malaysia’s findings that the lethal nerve agent VX was used to kill him without apparent harm to anyone else. Malaysian police have released virtually no forensic evidence connected to the high-profile assassination of the estranged half-brother of North Korea’s leader Kim Jong-Un. Scientists are confounded by how VX — a toxin so deadly it is classed as a weapon of mass destruction by the UN — was deployed in an international airport without causing serious injury to the assailants, first responder medics or other travellers. “We are building speculation upon speculation” to explain what happened, said Jean-Pascal Zanders, an expert on disarmament who focuses on chemical and biological weapons. Airport CCTV footage on 13 February shows two women approaching the 45-year-old victim and apparently rubbing his face with a cloth. He died minutes later, according to police, who found traces of VX on his face. Indonesian Siti Aisyah, 25, and Doan Thi Huong, 28, from Vietnam, have since been charged with his murder and have told diplomats they were duped into believing they were participating in a TV prank show. Police have rejected those claims but have not released any evidence to explain how the women were able to handle one of the world’s deadliest toxins without suffering severe harm. VX is an organophosphate compound that strikes the nervous system, over-stimulating glands and muscles till they tire and stop working. People exposed to high doses of the toxin experience seizures, heart failure and a shutdown of the respiratory system. Since it evaporates slowly, it can potentially contaminate areas for long periods of time. A global treaty signed by more than 160 countries that went into force in 1997 prohibits the production, stockpiling and use of VX. North Korea, which is not among the signatories to the treaty, has been blamed by Seoul for Kim’s assassination, with the South saying the regime’s leader wanted to eliminate a potential rival. I cannot see how the accused women would have administered a fatal dose of VX directly to the victim without sustaining corresponding life-threatening injuries themselves. Not so fast. Some experts have put forward a hypothesis that the killing was carried out using a binary version of VX known as VX2. In that case, the assassins would have separately applied two chemicals to his face, using a precursor which is not severely toxic on its own but lethal once combined with sulphur. The theory would also explain why two women were used for the attack. “The simplest explanation is that it was binary,” said Matthew Meselson, a professor at Harvard University and member of the national advisory board at the US-based Center for Arms Control and Non-Proliferation. As the two chemicals combined on Kim’s face to create VX, the assailants would have been unharmed while the delayed reaction would have allowed him to continue walking as shown in the CCTV footage. It is also easier to transport VX across borders when it is broken down into two seemingly innocuous components. Why use VX instead of other toxins? Experts believe Pyongyang made a considered decision to use VX instead of the more commonly deployed Sarin. “Sarin kills indiscriminately — there’s a heavy risk of collateral damage. To use it in a foreign country would have been an act of war,” said Vipin Narang, an expert on nuclear strategy at the Massachusetts Institute of Technology. Unlike Sarin, which evaporates quickly whether deployed as a gas or liquid, VX vaporises slowly, giving authorities time to cordon off affected areas before large numbers of people are exposed to it. Is there any way Kim could have survived? Although just one drop of VX can kill a man when inhaled, the nerve agent takes longer to penetrate the skin, meaning that Kim could have survived had someone injected him with its antidote atropine within minutes. Even simpler, he could have washed his face to remove the toxin — which is soluble in cold water — as the two assailants did, washing their hands soon after the attack. “If he had… washed his face or rubbed it off with tissues, it could have reduced his exposure,” Harvard professor Meselson said. “He might have ended up sick, not dead”. Why are experts still doubtful? The binary theory relies entirely on circumstantial evidence and it doesn’t explain how the medics who treated Kim shortly after the attack escaped contamination, disarmament expert Zanders pointed out. “People are assuming it is VX and then finding reasons for why certain anomalies exist,” he said. Email “There may be more mystery to the death of Kim Jong-Nam than was first thought”. Feedback on “There may be more mystery to the death of Kim Jong-Nam than was first thought”.